I was going to do a different Mancat Monday today but instead I'll dedicate this blog to a dear, sweet Twitter furrend, who went to the Rainbow Bridge last night at 11:45. Petie (@Petiethecat on Twitter) was a true gentleman. For the past couple of years, he's had to deal with many health issues, but he never complained. He fought the good battle and always thought of his Mama and Daddy. I truly believe his love and desire to stay with them kept him going. He is survived by his Mama and Daddy and his wife Pandafur. She's quite broken up so I hope you visit and offer her comfort. I love you Petie! Thank you for being a good Twitter furrend and for the prizes you always donated to the Pawpawties. I wouldn't have my beloved FURminator if not for your generosity. Every time I see the vibrant reds and oranges of a rainbow, I'll think of you. I have major sad now. I hate to see our anipals have to leave for da bridge. 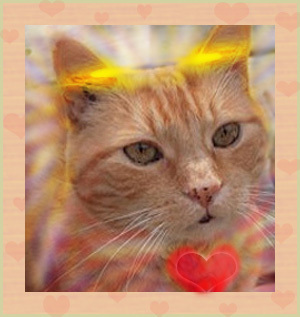 purrs and prayers for da family left behind. Nice tribute for Petie CK. I miss him so much already. he was one of my first friends here in Twitterland. He always thought of everyone else first no matter what he was going through. I am so sad. I was so very sad when I saw that news this morning, it is still hard for me to believe it was his time to go. He touched so many lives and he will live in all of our hearts forever. That was a beautiful tribute to a beautiful friend. This is the saddest news... We're all going to miss Petie so very much. CK, your softer side is showing today and it's looking quite nice. What a sweet and wonderful tribute to Petie. So sad for his family...we will go and give some purrs to Pandafur. What a beautiful tribute. You have such a way with words. I am purring lots for Petie's human's today. That is a sweet tribute. Purrs for Petie's humans. That was bootiful CK. We're sure going to miss our pal. That is a lovely tribute to Petey. I didn't know Petey and I am so sad that I didn't know him. So now our slack Mom is trying to figure out Twitter and how to do it. Hope you have a fantastic evening. What a wonderful tribute to a beautiful Angel Petie. We were deeply saddened to learn of the passing of Petie. We didn't know him well but remember seeing his lake posts on Twitter and we remember when he married Pandafur. We are so deeply sorry. Your post was beautiful and I am sure Petie is purring from someplace over the bridge with pleasure. We are so sorry to hear about Petie. He will be missed. CK, thank you for this wonderful tribute! We give Petie's humans softpaws, we know they're so broken up over this...as are we all. It was lovely and comforting to be with you last night, Darling. I feel much happier now! However, they may be a sometime thing. I don't think we will have stars ALL the time. Thank you KC for that wonderful tribute to our dearest Petie.He will be in our hearts forever.Love you sweet boy. That is a wonderful tribute for your friend Petie. We send his family very big purrs for their very sad loss. I'm a Celebrity, certainly NOT a Trainwreck!! What's a Girl Cat To Do? ?